The board of the Northeast Frontier Railway has come out with the latest update i.e NFR Apprentice Recruitment 2018 at the official website @ www.nfr.indianrailways.gov.in. So, job seekers once check out the eligibility conditions and apply for the Northeast Frontier Railway Apprentice Recruitment through the offline process. Hurry up, Guys !!! the application process has already started from the 29th November 2018 and the NFR Apprentice Application Form download links will expire on the date of the 31st December 2018. So, aspirants rake the chance and apply for the NFR Railway Apprentice Recruitment before the last date of the application process. Apply for the Northeast Frontier Railway Apprentice Recruitment, the whole detail are provided on this page @ www.jobschat.in. 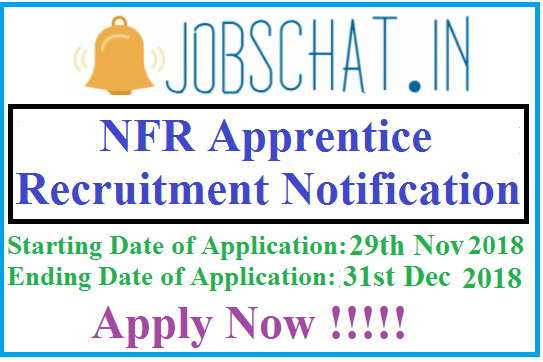 Candidates if you want to know the more details about this NFR Apprentice Recruitment, once refer the NFR Apprentice Official Notification, the links are mentioned on this web page. The board of the NFR has published the 4329 Posts for all the job hunters and total vacancies are related to the Act Apprentice Posts. So, interested and eligible candidates can apply for the www.nfr.indianrailways.gov.in Apprentice Recruitment. Before going to apply for the NFR Apprentice Recruitment, candidates must check the eligibility criteria. Such as starting and ending dates of the application process, age limit, application fee, educational qualifications, selection process, and more other details, which are available on this page. After observing those details, if you are suitable for this Northeast Frontier Railway Apprentice Recruitment, then without any delay enroll your name in this notification through the provided NFR Apprentice Application Form. Extension to this, applicants you may also know the details of the Government Job Notifications in any state, by just click on the mentioned link on this web page. Applying candidates of the NFR Apprentice Recruitment must and should have the qualification in the 10th class examination or its equivalent (under 10+2 examination system) with minimum 50% marks from recognized Board. And also must possess ITI in relevant trades approved by NCVT/SCVT. The minimum and maximum age limit details are available on the below page. The selection of the applicants will be based on the following two phases, those are explained on the below page. Merit Score of their educational qualifications. Selected applicants will get the best salary from the board of the Northeast Frontier Railway. Northeast Frontier Railway (NFR), The Senior/ Divisional Personnel Officer of respective units/ workshops of different Divisions (for unit addresses refer the notification). On the date of the 31st December 2018, the Northeast Frontier Railway Apprentice Application Form will expire. So, candidates who are willing to apply for the NFR Apprentice Recruitment, those ones must submit the application form to the board of the Northeast Frontier Railway before the last date. Candidates, after filling the application form must and should attach the some of the basic necessary documents to the application form, those are clearly mentioned in the application form. Finally, send the Northeast Frontier Railway Apprentice Registration Form to the postal address, which has mentioned on the above page. Here on this page, candidates can get the whole details about the NFR Apprentice Recruitment. So, contenders who are applying for this www.nfr.indianrailways.gov.in Apprentice Recruitment, those ones once check the all the mentioned details in this page. After that apply for this notification before the links expire. In the world, almost all the candidates are dreamed to get the job in the Central Government Departement, because the facilities are more. So, Candidates now take the chance and apply for the Northeast Frontier Railway Recruitment Notification through the offline process.